The United States has elected Barack Obama as the next president. We acknowledge that he is our president and we hope he makes the United States a better place for all of us. We also recognize that some upsides exist to having Obama as our president. However, we watched Obama make promises during the campaign to implement policies that will be devastating if he carries through with them. We are basing our forecast of the next four years based on what Obama himself said he will do. We hope for the best and plan for the worst. In 1976, we needed a Jimmy Carter to get Ronald Reagan and today, we may have needed a Barack Obama in order to get Mitt Romney. In four years, if Obama implements his policies, America is going to be in such a mess financially (and in a lot of other categories) that we will need an extremely capable and experienced President to fix our country. People will be more engaged and able to see past any attempts to slander Mitt Romney because it takes only a small amount of research to see how baseless the attacks of liberals on Mitt are. 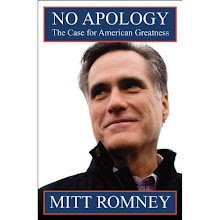 After the 2008 elections and the Democratic gains in the house, senate and the presidency, the Republican Party realizes what a huge mistake it made by not nominating Romney. 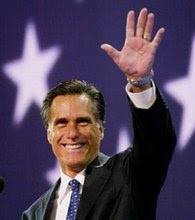 Mitt emerged from relative obscurity to become one of the front runners of the Republican nomination in 2008. Most conservative leaders endorsed Mitt days before Super Tuesday, but it was too late. They will endorse Mitt much sooner next time! Combine that with the fact that there is no way Obama can deliver on all of his campaign promises, and Mitt Romney will be elected our 45th president in 2012! Study after study showed that Mitt was attacked far more than any other candidate by the liberal elite during the primaries and even after he dropped out and some expected Mitt would become VP. Anyone who watches the Daily Show, Colbert Report, MSNBC, or other liberal-leaning programming must have scratched their head at how much Mitt was (and continues to be) attacked. That should tell you something. Also consider the way those same liberals celebrated when Mitt dropped out and once again when Mitt wasn't chosen for VP. Liberals fear Mitt most and for good reason. 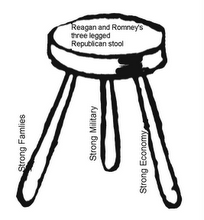 Mitt represents the largest and strongest threat to liberalism in America. Who sacrificed his chance to win the nomination in order to help John McCain unify the party? Who endorsed and went to more events for conservatives than Mitt? Who was in Denver leading a conservative rally during the democratic convention? Who was the most vocal figure to defend John McCain and Sarah Palin during the toughest parts of the campaign? Who finally gave a voice to the conservatives who needed one to address the auto bailout? Conservatives are hungry for a real leader. One has emerged, and it's time we Rally to Romney! Keeping Americans Safe at Home and Abroad: We must strengthen our military and transform our domestic civilian international efforts to meet a new generation of global challenges. We should treat our Veterans with the respect and care they have earned. Combating Nuclear Terrorism: We are faced today with the horrific proposition that those who speak of genocide are developing the capability to carry it out. Confronting Radical Jihad: The consequences of ignoring this threat such as a radicalized Islamic actor possessing nuclear weapons are simply unacceptable. Advocating Public Service: Mitt will carry the torch from his father (former Michigan governor George Romney) in being a strong advocate for public service. Strengthening Latin American Allies and Confronting Tyrants: It is time for the United States to adopt a Latin American strategy that will strengthen the institutions of freedom. Winning the Global Economic Competition: We must improve America's global competitiveness and unleash the American economy through lower taxes and less government. Open foreign markets to US products and goods. If we operate much smarter, we can balance the ridiculous trade deficit that we not have every year. It will take drastic measures, but fortunately we have a man who is proven to take whatever drastic measures are necessary to fix the problems he's faced with. Making the Tax Code Simpler and Smaller: Just look at what Mitt did in Massachusetts. He closed loopholes that were stopping certain people and corporations from paying their fair share. Without raising taxes, we can balance the budget while making the tax code more friendly for the suffering middle and lower class. Ending Our Dependence on Foreign Oil: As long as we import much of our oil from unstable regions and countries, our national security and economic prosperity are threatened. We will protect the environment at the same time. We must tap into every safe form of energy we can while increasing research on new forms of energy. Ending the Tide of Illegal Immigrants: We must secure the border, implement an enforceable employer verification system, punish sanctuary cities and reject amnesty. Working Across the Isle: Mitt will pick the best and brightest (regardless of party) to solve America's toughest problems just like he did as governor of Massachusetts. Reducing Spiraling Health Care Costs: A free market, federalist approach to make quality, affordable health insurance available to every American. Look at Mitt's health care plan in action in Massachusetts where the numbers of uninsured people has fallen drastically and the only problems with it are the mandates that Mitt fought to keep out. Confronting Threats to American Culture, Values, and Freedoms: The American values that have been at the heart of our historic rise to world leadership are being challenged everyday. We must protect the freedom of religion...not freedom from religion. As for Mitt's pro-life position, he will appoint strict constitutionalist judges should there be any openings in the Supreme Court, but while we're waiting, Mitt will do far more than even Bush did. The Republican Party has been dragging the pro-life crowd along for years now, but not much has been done besides the good judges Bush appointed. Mitt will work to institute policies that provide care and counseling for women who are struggling with a decision on an abortion. Mitt will work to increase the capacity of adoptions. Mitt will work to implement parent notification laws so minors can't get an abortion without parental consent. Mitt will work to bring into law the law that some states have implemented where women have an ultrasound before they get an abortion which has had a drastic effect in decreasing abortions everywhere it has been implemented. Mitt also wants to make sure people understand that being pro-life doesn't simply mean standing up to protect life in the womb, but it also means doing what we can to protect and preserve the lives of every American as best as we can. Raising the Bar on Education: Improving our schools is critical to the future of our country and our economy. Closing the achievement gap in our schools is the civil rights issue of our time. Many politicians promise things like this, but once again, all you have to do is look at Mitt's track record in Massachusetts where Massachusetts ranked #1 for public schools by the end of Mitt's term as governor. Rebuilding/Repairing America's Infrastructure (i.e. roads and bridges): This not only improves safety and efficiency, but these projects provide jobs for hardworking Americans as well. This is great! 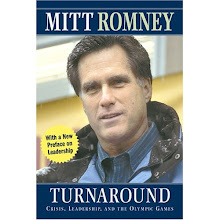 I know that if anyone can get our country back on track it is Mitt Romney. Carbon dioxide emissions are also a non prblem. No carbon dioxide no plants...ie. no food.